- Complete Clean Linen Participant - ALL linens, including comforters laundered upon every checkout. EXECUTIVE ACCESS: WaterColor guests staying at this 360 Blue property have complimentary access to 6 award winning community pools, the use of two kayaks or canoes for one hour per day, as well as 20% off stand up paddle boards at the WaterColor Boathouse and, for an additional cost, limited tee time access to award winning Shark's Tooth and Camp Creek Golf Courses, 20% off daily or weekly passes at the WaterColor Fitness Center and 2 tennis courts at both WaterColor and Shark's Tooth Club. 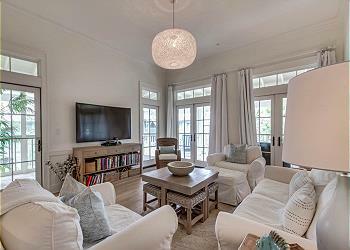 DETAILS: There's nothing like the style, comfort and convenience of this beautifully decorated first-floor unit in the heart of the TownCenter. The white sands of the Emerald Coast are just a few steps away, as are the spectacular amenities of WaterColor, including the BeachClub, the BoatHouse and the neighborhood pool. The kitchen features stainless steel appliances, designer cabinetry and beautiful countertops. It opens onto charmingly decorated dining room that seats six. The living room features a queen sleeper sofa and has an entertainment center that features a TV/DVD, a stereo system and views of beautiful Cerulean Park. The master suite has a king bed with its own bath that comes with a double vanity and a jetted tub. An entertainment center features a TV/DVD/VCR ensemble. The second bedroom has a queen bed and an attached bathroom with a single vanity and a tub/shower. The furnished screened-in porch makes it a great place to relax in the evening. We had 4 adults and one 9 year old, this is our 3rd stay in 102-10. We have stayed a couple of times on Layona Lane and once on Buttercup. Watercolor is our vacation spot as we love the condo, bikes and beach. Look forward to using new pool next year. Grandson loves the fishing in the bay by bike shop. We are so thrilled that you enjoyed your vacation with us in Watercolor! Thank you for staying with 360 Blue, we hope to be able to host you all again very soon! What a perfect stay! The unit was absolutely gorgeous and in an ideal location. Across from the beautiful park and just a short walk from the beach. The gourmet kitchen had everything we needed (even a garlic press) and was a joy to cook in. We especially enjoyed having coffee on the screened-in porch in the morning and relaxing on the comfy sectional after a great day at the beach. WaterColor is so picturesque and the Beach Club is nice and convenient. We received exceptional customer service from Trisha from 360 Blue! She went out of her way to make sure our vacation was absolutely perfect! We can’t wait to come back! My husband has never been a fan of the beach before, but after our perfect stay in WaterColor he’s ready to go back and has already asked me to start looking at rentals for a 2018 vacation. We’ll definitely book with 360 Blue when we come back next year! By far the best vacation we’ve been on. Thanks again, 360 Blue! We are thrilled that your stay was perfect! We agree that the location of this condo truly cannot be beat. In just a short walk, you have access to the beautiful beaches of Watercolor, which are fantastically represented in your picture. The fully stocked gourmet kitchen, screened-in porches, and comfortable furniture make it easy to enjoy a cup of coffee in the morning and a cocktail after a fun day at the beach! We adore Trisha as well and are so glad she helped make your vacation perfect. We hope you and your husband can head back to the beach to stay with us again soon! Thank you so much for your feedback and for being such loyal guests to 360 Blue!